“Harry moved gladly into the shade of the gleaming kitchen. On top of the fridge stood tonight’s pudding: a hung mound of whipped cream and sugared violets.” – Harry Potter and the Chamber of Secrets, J. K. Rowling, Chapter 1, page 10. Years ago, I helped out at a Harry Potter Halloween Party and made a whole assortment of HP-inspired treats, including butter beer, pumpkin juice, cauldron cakes, pumpkin pasties, and butter beer cupcakes. For this week’s theme and challenge, I wanted to try something new. 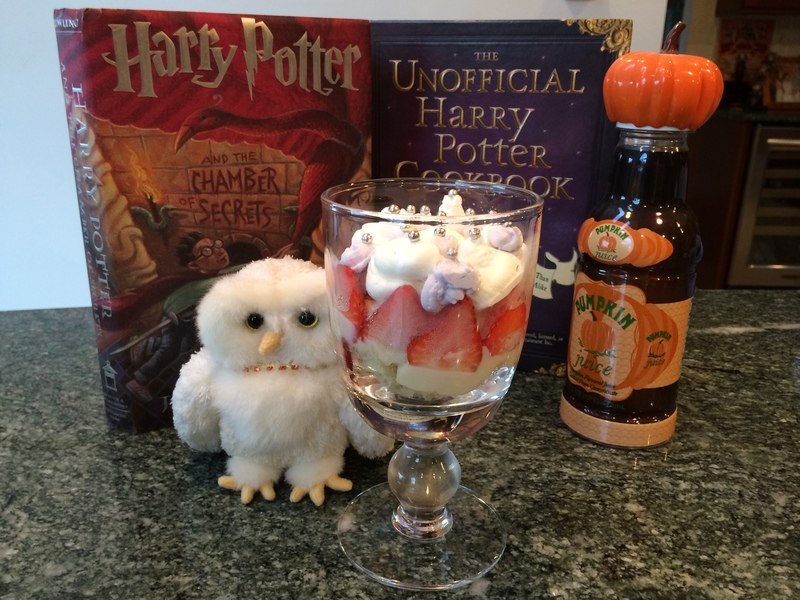 Flipping through my copy of The Unofficial Harry Potter Cookbook, I came across “Petunia’s Pudding (English Strawberry Trifle)” in the chapter labeled “Good Food with Bad Relatives.” As this dish appeared in both the book and the movie, I decided it would be a good way to start off Harry Potter Week. In America “pudding” generally means chocolate or vanilla Jello-style pudding, maybe served with crushed Oreo’s to make “dirt in a cup” with some gummy worms. The Harry Potter books, as well as my year in the UK, opened my eyes to the British version pudding, which can encompass a whole range of desserts. “Aunt Petunia’s masterpiece of a pudding, the mountain of cream and sugared violets, was floating up near the ceiling. On top of a cupboard in the corner crouched Dobby. . . . The pudding fell to the floor with a heart-stopping crash. Cream splattered the windows and walls as the dish shattered. With a crack like a whip, Dobby vanished.” – Harry Potter and the Chamber of Secrets, J. K. Rowling, Chapter 2, page 19. As for Aunt Petunia’s Pudding, I’m sure other HP readers out there were equally pleased and horrified when Dobby caused Petunia’s Pudding to come crashing down. Certainly the film version was worse – onto Mrs. Mason’s head! Even a perfectly delivered Japanese-Golfer-Joke-punchline couldn’t save the catastrophe of an evening. Also, why did Harry walk over to the floating pudding in the movie? Was he trying to catch it? Or was he just trying to save the situation from being obviously magical in front of more muggles? Add this to my list of things that Harry does in the movies that I don’t understand (i.e. slowly crawling backwards away from an approaching enemy instead of turning around and sprinting). This pudding was fairly easy to make. First, I baked a yellow loaf cake. Any standard yellow cake or pound cake recipe will do. Second, I whipped up the custard. This was a bit more involved, as it requires you to stand at the stove constantly stirring to ensure a smooth and glossy texture. Both the cake and the custard needed time to cool, so in the meantime I made a batch of whipped cream. 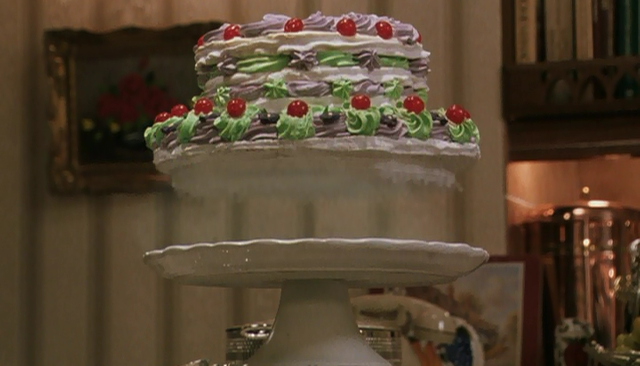 Aunt Petunia’s pudding in the film is very embellished with purple and green decorations, so I added a bit of food coloring to my whipped cream. I think there are cherries on her pudding, but I prefer strawberries, plus we have a lot of them right now. Then it was time to assemble. You cut the cake into 1/2 inch thick slices, edges trimmed off, then layer strawberry jam onto half of the slices and top with the remaining slices. Next, cut the cake sandwiches into 2 inch squares. Layer the squares on the bottom of a glass serving dish, then spread the custard over the cake layer. The recipe in the book instructs you to line the perimeter of the cake with sliced strawberries and pile the rest in the center, but I instead made individual servings of this dessert. The recipe also calls for the cake to be covered with plastic wrap and refrigerated for 8 hours to overnight to allow the flavors to meld together. Finally, when ready, remove the plastic wrap and spread the whipped cream over the trifle. I colored half of the whipped cream to be lavender, similar to in the film. Decorate with toasted almonds, or in Aunt Petunia’s case, sugared violets. No almonds or sugared violets – just tiny silver balls to decorate. So there you have it, my take on Aunt Petunia’s Pudding!